Every year we try and grow as many vegetables and herbs in our little urban garden as we can. 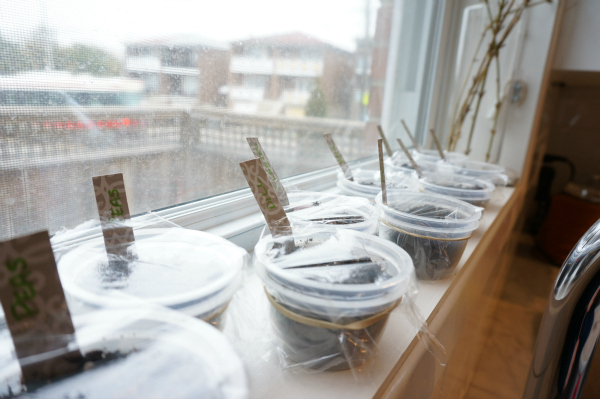 One of my favourite parts of gardening is the magic (and science) of growing seedlings on the window sill. 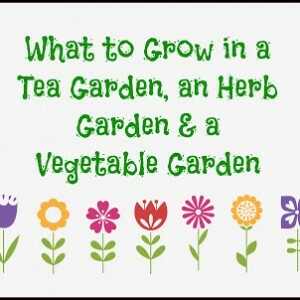 This year we are planning on starting a tea garden – growing our own herbs to use in making teas. Every plant in the garden starts with a seed. No matter how many time I do this, starting seeds seems magical to me. 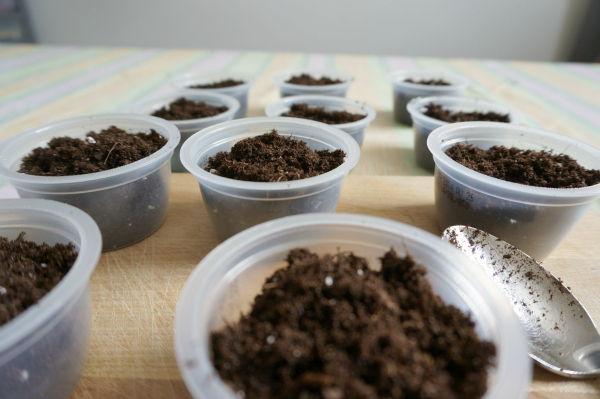 You place a few seeds inside some soil and wait for the plants to appear. It’s so amazing to see the tiny plant peer out through the soil. The last couple of years we have been starting our seeds in egg cartons and toilet paper rolls. This year we reached inside the recycling bin to find a planter for our seeds. I discovered that we have been eating a lot of single serving apple sauces as of late. We have a lot of little plastic containers around. So, we decided to use these containers this year. Gather the apple sauce containers or yogurt containers would work as well. 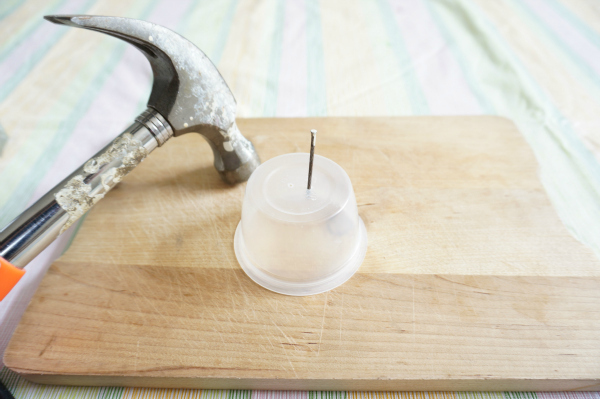 Use a hammer and nail to make small drainage holes in the bottom of half the containers. Fill up the containers, that have the drainage holes, with seed starting soil. You will find specialized seed starting soil at your local garden centre. 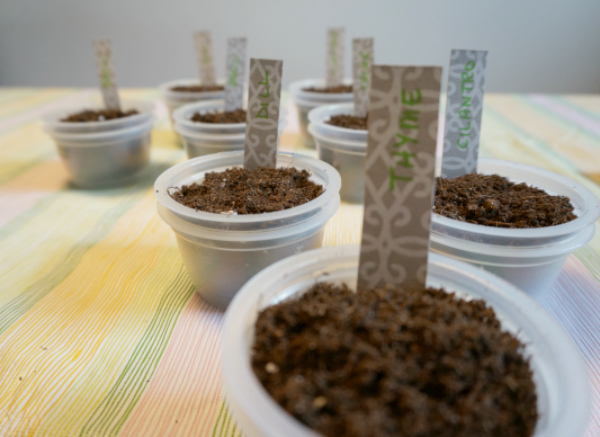 It is important to use a proper seed starting soil, as it will have the proper balance of nutrients, peat and soil to easily germinate the seeds. Follow the seed package direction’s to determine how deep to plant each type of seed. 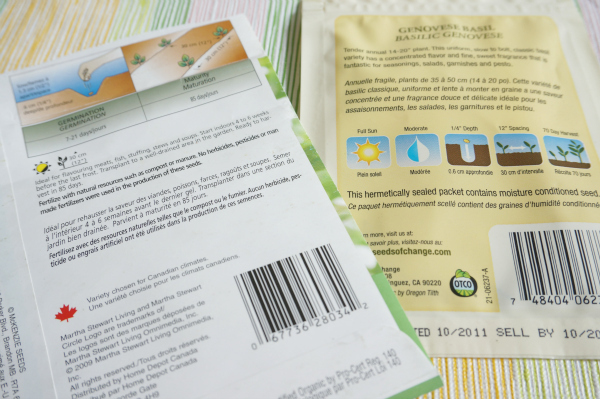 I tend to plant WAY more seeds then the package suggest, I’m always a little nervous that the seeds won’t germinate. 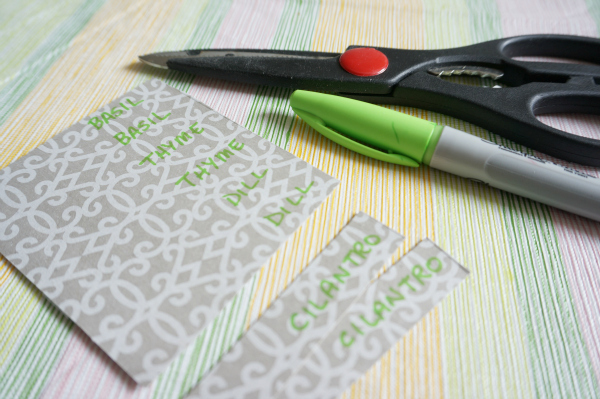 Make labels for each pot, I cut strips out of an old box of tea that was in the recycling bin. Place the container that has the dirt and seeds inside a container that does not have drainage holes. The great thing about the apple sauce containers is that when you place one inside the other there is a 1/4″ gap created between the containers. This space is perfect for collecting any water that seeps through the drainage holes. 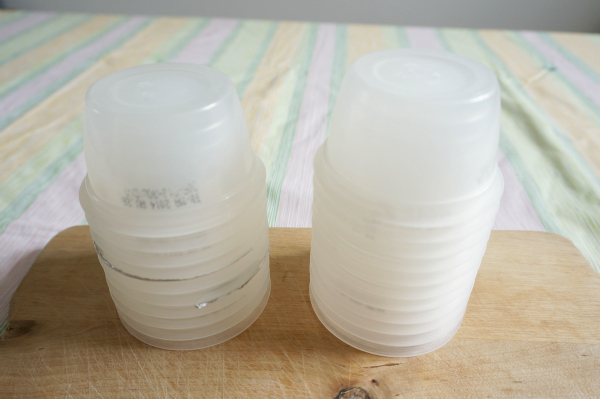 Now, Loosely place a piece of plastic wrap, secured with an elastic, over each container. This will create the warm and moist environment that is perfect for promoting germination. Place the pots in a sunny window, or in another warm location, keep the soil moist and wait. This is always the hardest part. Patience in gardening really is so challenging. Every morning the girls and I run to the window ledge to check on our little pots…searching for signs of life. I told you, it’s magic. This round of seeds will be for our traditional herb garden. We will be planting our herbal tea seeds next and then some veggies and flower seeds. As you can see, I think I need to get a bigger window sill! 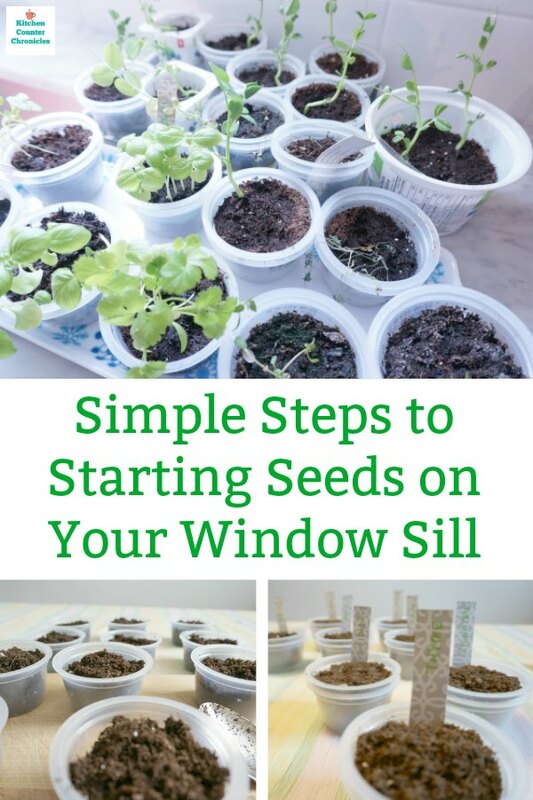 Are you starting seeds this spring? What are you starting? 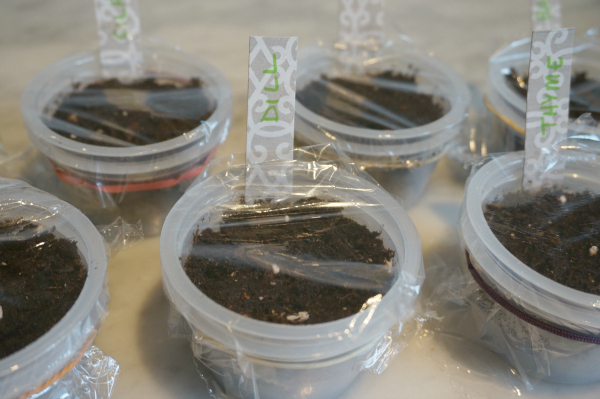 What container do you use to start your seeds? I would love to hear your experiences. Let your favourite children’s book inspire your garden design. 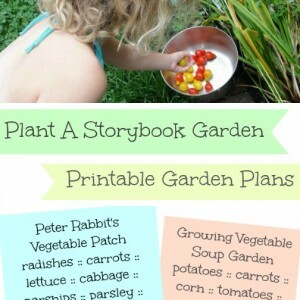 What will you grow in your home garden? Oh this looks like a fun project to tackle on a rainy afternoon!! Spring will come eventually and perhaps we will be prepared! So easy and so practical and yet I never do it. I always think I will and then the weeks pass by and it’s too late. Can’t wait to see how your seeds progress! 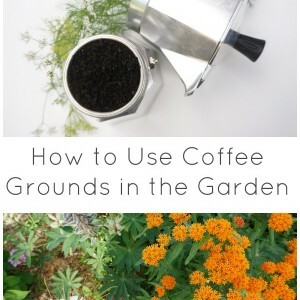 A tea garden is such a great idea! Thanks for the tips! This looks like a lot of fun and I want to try it! 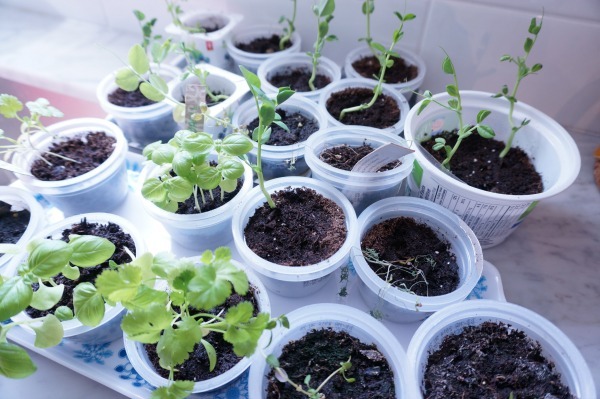 I have a question – once the seeds start to grow up and out of the soil, do you replant them into bigger pots? If so, do you mix them into one big planter? Also, what kind of soil would you use if you transfer it to another pot (since it’s not a starter soil anymore?) Finally, would you transfer these plants to a deck or outside or are they safe to just keep inside? Great questions Rey! In general when the seedlings have grown and are getting to big for the little pots I usually plant them directly into my garden. I guess if the weather wasn’t quite warm enough I could re-pot them, but that just seems like a lot of work. If I was transferring to another pot I would use a container soil, perhaps one specifically designed for veggies. As for transferring outside or inside. Herbs can generally grow indoors, if you have enough sunshine and water them. However, I would plant them outside in a sunny spot. My garden soil is a general topsoil with compost added. Hope this helps answer your questions. The best thing about starting your seeds is it doesn’t cost too much, so if they don’t work out you can always plant some more! Good luck!